For feedback on the design of a cycling route along the A38 between Sely Oak and the city centre. 64% of questionnaire respondents like/ really like the proposals. 14% don’t have a strong view. 23% do not like the proposals. Some parts of the scheme design have been amended. The Full Business Case has been approved and published. Greater than 85% of responses were made via BeHeard. Almost 200 people attended drop-in events along the route. More than 6,000 individual comments received. Over 200 respondents (22%) gave positive feedback with direct reference to the proposed facility being ‘safe(r)’ and a further 200 commenting positively on the general benefits these proposals would bring about. There were various aspects of the proposals (either across the scheme or specific to certain locations/ elements) where concern/ negative feedback was raised. 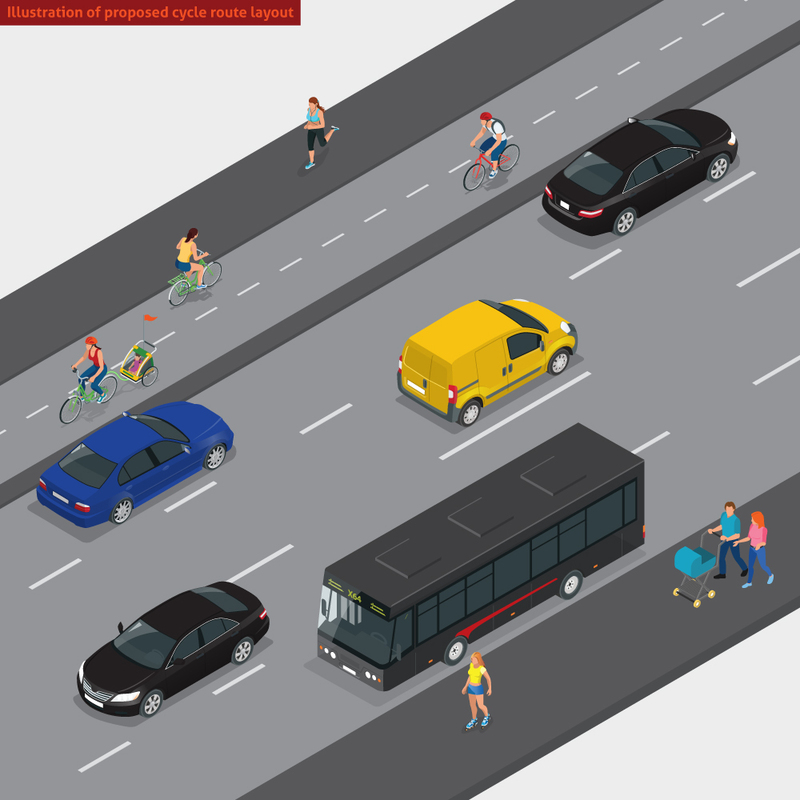 Overall, 53% of respondents said that they would be likely to use the new cycle route. It should be noted that 37% of those who currently mainly drive in the area say they are likely to use the new cycle route and a further 14% think they might use it. This indicates good potential for modal shift from car to bike. Birmingham Cycle Revolution is making cycling easier and more accessible, for transport and for leisure, in Birmingham. We want our city to be less congested, greener, safer and healthier. Our vision is for 10% of all journeys in Birmingham in 2033 to be made by bike. 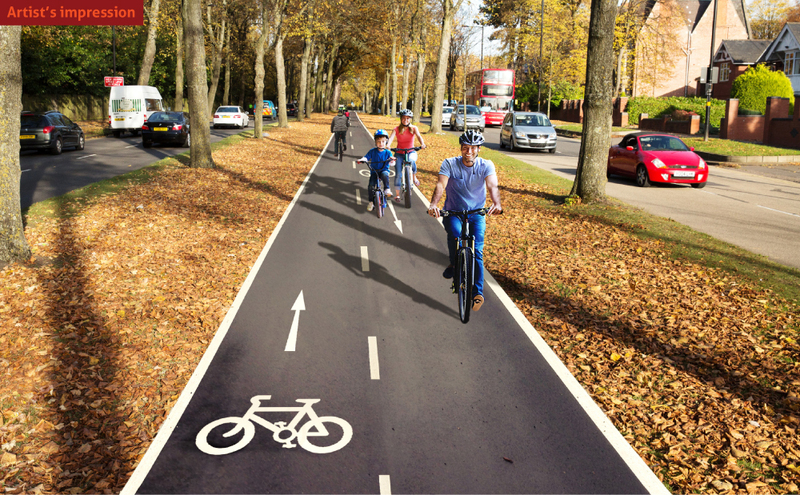 We are planning to build 4km of two-way, fully segregated cycleway along the A38, linking Selly Oak and the University of Birmingham with the city centre. Our aim is to provide an easy and comfortable cycling experience on a route which new and existing cyclists feel confident using. The route is direct and gives cyclists protection from traffic and prioritised travel through junctions. We are now consulting on the details of that route and how it will fit into the existing street layout. The route will connect with the existing cycle facilities on Hurst Street (National Cycle Network route 5), running along Kent Street, Wrentham Street and onto Bristol Street. From Bristol Road, the route will run alongside the pedestrian footpath, before crossing to the wide central reservation. The route will run in the central reservation to Edgbaston Park Road. It then crosses back to run alongside the footpath, linking to existing cycle facilities on Selly Oak New Road. 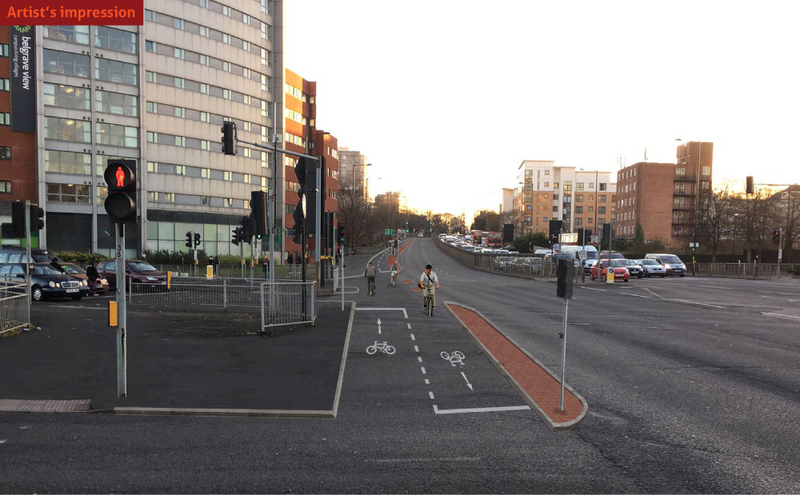 Improvements to the junctions at Belgrave Middleway and Priory Road will benefit pedestrians as well as cyclists. Between Edgbaston Park Road and north of Pebble Mill Road, the cycle track will run in the tree-lined central reservation. The picture below looks north east, towards the city centre. From north of Pebble Mill Road and Wellington Road, the cycle track will run on the west side of the Bristol Road, using some of the current footpath. Cyclists will be at a different height to both pedestrians and traffic. The bus in the picture below is travelling south west, towards Selly Oak. At the junction of the Ring Road and the A38 (Belgrave Interchange), cyclists will have their own traffic signals, co-ordinating with the vehicle signals. A raised kerbed area will provide further protection to cyclists. The picture below looks south west, away from the city centre. If you are interested in the details of how the route will work you can look at the drawings we have produced below. If you are interested in a particular part of the route, the first page, with red boxes, should help you find the right plan. These drawings can also be downloaded as a PDF at the bottom of this page. On the drawings, the cycle track is shown in blue to make it easy to see. The actual colour of the route’s surface has not yet been decided. Once the consultation has closed, we will read and consider all the feedback we have received before finalising the route's design. We hope to begin construction later in 2017. Any personal information you give us in response to this consultation will be held in accordance with the Data Protection Act (1998) and used for this consultation only.